Finally, Michael discusses what we can all do to get “our buildings” back out of the hands of those who are destroying the Church and endangering the whole world in the process. All we have to do is THIS. In 1977, Msgr. Ducaud-Bourget and 1000 traditional Catholics did THIS just blocks from Notre Dame, and it worked! As Catholics celebrate Easter, I couldn’t help but regard the burning of Paris’ Notre Dame Cathedral—on the Monday of Holy Week, no less—as an ugly metaphor for the tribulations that our faith is suffering throughout the European continent and the whole of Western civilization. Was Ronald Regan’s defeat of portions of Communism and the Errors Of Russia – the Divine Providence of OL of Fatima Prophesies or that of the Occult of Freemasonic teachings ? Now, suddenly, I’m seeing demonstrators who have emblazoned on their vests the words DEUS VULT. Others have drawn on their vests pictures of the Sacred Heart with a cross at the top – the famous badge of the Catholic royalist peasants of the Vendée who fought against the Revolution of 1789. There aren’t a great many of them, not yet, but their presence in any number begins to give the demonstrations and movement focus and to turn the yellow vests in a rightward direction. It may also reinvigorate the movement. The Interior Ministry reported that 40,500 participated in the demonstrations of March 23, the nineteenth Saturday of them. This even though the government called in army troops in addition to police to “keep order,” the first time since 1948 that the military have been used to do this. Some sections of cities were cordoned off from demonstrators. In Paris anyone seen wearing a yellow vest on Champs Elysees Avenue was fined 750 euros. Barred from the avenue, the yellow vests made the Basilica of the Sacred Heart (Sacre Coeur) their rallying point on the 23rd. Deus vult! Statue of St. Adalbert of Prague. Part of Wenceslas Monument on the Wenceslas Square in Prague. National Museum in the background. Why has the Traditional Latin Mass returned? With the crises in the world today, more and more people (especially young people) seek an alternative to the “modern world.” They are returning in droves to the wisdom of the ages, to things tested and timeless. For many young Catholics and converts to the Catholic Faith, this has included a return to the Traditional Latin Mass. 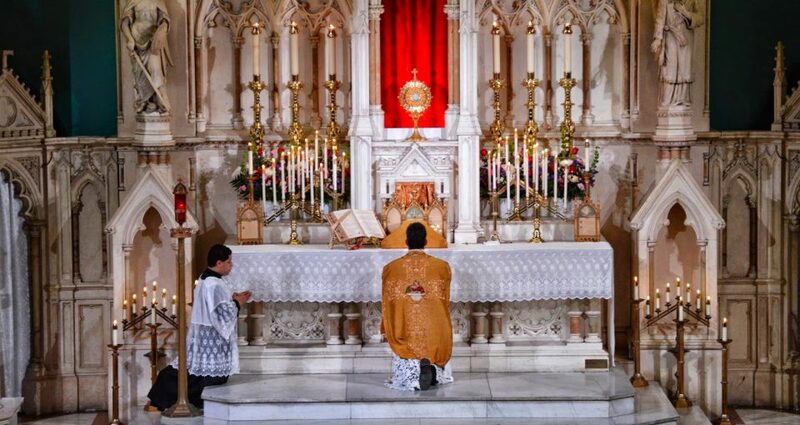 Recognizing that the Traditional Latin Mass has never been abolished or forbidden, Pope Benedict XVI affirms in his July 7, 2007 Motu Proprio entitled “Summorum Pontificum” the right of every Catholic priest in the world to offer this Mass. The National Museum of Ireland in Dublin possesses the Bell of St. Patrick, which was removed from St. Patrick’s grave sixty years after his death. From the Editor’s Desk, Michael J. Matt points out that the worst pro-abort politicians in the world are Vatican II Catholics. And now that the neo-Catholic compromise has failed to appease the world–with Cardinal Pell and other shepherds off to jail–Michael contends that we are in the last days of the Modernist Revolution in the Church, and that the only hope of the world is the traditional Catholic restoration. Plus, was the priesthood always corrupt, as so many revisionist historians contend? Michael takes a walk down movie memory lane to put the lie the Catholic-bashing claim that “it’s always been this way.” And, finally, Michael points out how the Modernist regime is intentionally destroying the old Catholic Church–the Church that built the greatest civilization in history–on purpose in order to make room for the New World Order. Lesson – Ez 18: 20-28 Thus saith the Lord God: The soul thatsinneth, the same shall die: the son shall not bear the iniquity of the father,and the father shall not bear the iniquity of the son: the justice of the just shall be upon him, and the wickedness of the wicked shall be upon him. But if the wicked do penance for all his sins which he hathcommitted, and keep all my commandments, and do judgment, and justice, living he shall live, and shall not die. I will not remember all his iniquities that he hath done: in his justice which he hath wrought, he shalllive. Is it My will that a sinner should die, saith the Lord God, and notthat he should be converted from ways, and live? But if the just man turnhimself away from his justice, and do iniquity according to all the abominations which the wicked man useth to work, shall he live? All his justices which he hath done, shallnot be remembered: in the prevarication, by which he hath prevaricated, and in his sin, which he hath committed, in them he shall die. And you have said: The way of the Lord is not right. Hear ye, therefore, Ohouse of Israel: Is it My way that is notright, and are not rather your ways perverse? For when the just turneth himself away from his justice, and committeth iniquity, he shall die therein: in the injustice that he hath wrought he shall die. And when the wicked turneth himself away from his wickedness, which he hath wrought, and doeth judgment, and justice: he shall save his soul alive. Because heconsidereth and turneth away himself from all his iniquities which he hath wrought, he shall surely live, and not die, saith the Lord almighty. Gradual Psalms 85: 2, 6 Save Thy servant, O my God, that trusteth in Thee. Give ear. O Lord, to my prayer. Offertory Bless the Lord, O my soul, and never forget all He hath done for thee, and thy youth shall be renewed like the eagle’s. “On the tenth of this month every one of your families must procure for itself a lamb, one apiece for each household. If a family is too small for a whole lamb, it shall join the nearest household in procuring one and shall share in the lamb in proportion to the number of persons who partake of it. The lamb must be a year-old male and without blemish. You may take it from either the sheep or the goats. You shall keep it until the fourteenth day of this month, and then, with the whole assembly of Israel present, it shall be slaughtered during the evening twilight. They shall take some of its blood and apply it to the two doorposts and the lintel of every house in which they partake of the lamb. That same night they shall eat its roasted flesh with unleavened bread and bitter herbs. It shall not be eaten raw or boiled, but roasted whole, with its head and shanks and inner organs. None of it must be kept beyond the next morning; whatever is left over in the morning shall be burned up. “This is how you are to eat it: with your loins girt, sandals on your feet and your staff in hand, you shall eat like those who are in flight. It is the Passover of the Lord. For on this same night I will go through Egypt, striking down every first-born of the land, both man and beast, and executing judgment on all the gods of Egypt—I, the Lord! But the blood will mark the houses where you are. Seeing the blood, I will pass over you; thus, when I strike the land of Egypt, no destructive blow will come upon you. “This day shall be a memorial feast for you, which all your generations shall celebrate with pilgrimage to the Lord, as a perpetual institution. For seven days you must eat unleavened bread. From the very first day you shall have your houses clear of all leaven. Whoever eats leavened bread from the first day to the seventh shall be cut off from Israel. On the first day you shall hold a sacred assembly, and likewise on the seventh. On these days you shall not do any sort of work, except to prepare the food that everyone needs. Over 150 Sacred relics will be on display at St. Helena Parish, 1315 Olmstead Avenue, Bronx, from 8 AM – 9 PM Today Tuesday, March 5 in the parish gymnasium. The annual Tavola di San Giuseppe – St. Joseph’s Table – Italian Tradition starting at 9:00 am St. Anthony of Padua Oratory in West Orange will host the Volunteers from the parish will prepare and serve Italian food using recipes traditional to this feast. Priest arrested anew for abusing 50 more victims , mostly Altar boys in Manila Philippines – Will The Cover-up Of His Bishop For Years Ever Be Punished ? Shakey Shupich – Hilary White On What’s Up With Francis-Church? How can you tell if they’re lying? – Hilary White On What’s Up With Francis-Church? Servants of chaos don’t control damage; they ride it like a surfer rides a wave. – Hilary White On What’s Up With Francis-Church? Vatican Summit Falls on St. Peter Damian’s Feast: Coincidence or Providence?